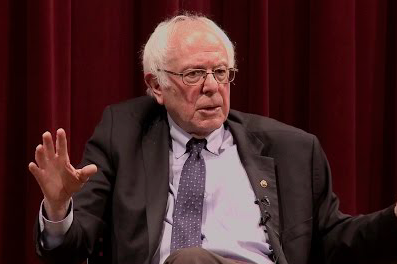 Bernie Sanders was interviewed by Democracy Now at the The Free Library of Philadelphia on Nov. 28, 2016. One year later, residency issues prevented him from winning an elections judge position thanks to a write-in vote in Center City. You hear that phrase all the time and, even if you parrot it, you kinda question it sometimes, don’t you? Well, guess the heck what: Every write-in vote mattered during the November 7 elections in Philadelphia. No, none of the big races were decided by a single vote. Down ballot, though, a Tuesday review of the write-in votes at the Board of Elections office over on Spring Garden Street saw new life breathed into that old adage. Let’s start with the judge of elections vote in the ninth division of the Fifth Ward, aka Locust to Pine between 13th and Broad streets. There was nobody on the ballot in that race, but four people received a single write-in vote each. Three of them – Robyne Watkins, Craig Weintraub and Stuart B. Lev – are registered voters in the division. The fourth – one Bernie Sanders – is not. The same goes for former Vice President Joe Biden, who received a single election-judge write-in vote in University City but was nixed from contention because of residency concerns. As if that weren’t enough, former President Barack Obama finished in a 1-1 write-in tie for election inspector in University City. Since neither candidate actually lives in University City, there will be no minority party inspector in the 27th Ward, 11th Division. The one-vote mantra also traveled down to Greys Ferry, where nobody was on the election-inspector ballot in the 36th Ward, 8th District. This one remains up in the air. The leading write-in vote getter also won a judge position, so it’s expected that he’ll pass on the inspector role. There are questions regarding the residency eligibility of the runner-up who received two votes. That potentially leaves one-vote recipient Molly Eichel in line for the inspector position. If Eichel’s name rings a bell, it’s because she’s the arts and lifestyle editor over at Philadelphia Media Network. Eichel also noted that she will not take the position should the chips fall her way. Some 4,855 write-in votes were tallied after the election, a figure that represents about half of those cast in the primaries.